The Audi e-tron Quattro is the first mass production electric vehicle from the German manufacturer and it will reach customers in the global markets by early 2019. 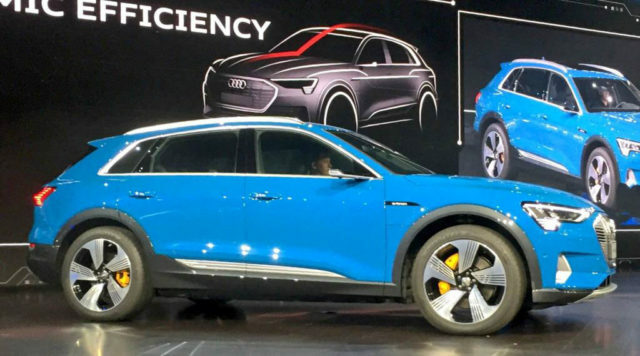 In the midst of big anticipation since its namesake concept debuted at 2015 Frankfurt Motor Show and following the public premiere of rival Mercedes-Benz EQC with 450 km on a single charge, the e-tron has finally broken cover today in San Francisco. Audi had faced troubles leading up to the e-tron’s world premiere and the untimely arrest of chief executive Rupert Stadler reportedly pushed back the initial launch plans. 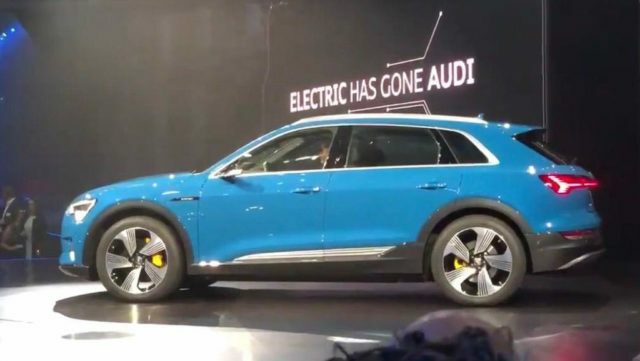 Nevertheless, the e-tron is finally here after all the buzz created over the months, and the expensive teaser campaigns proving the significance of the electric SUV. 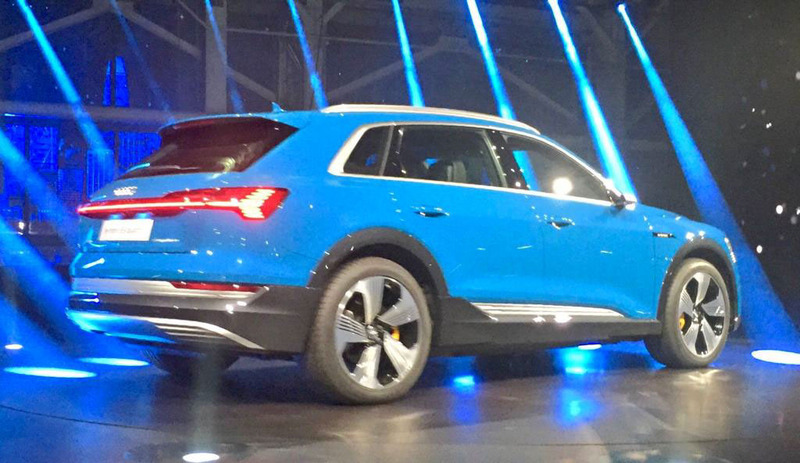 By 2025, Audi plans rolling out as much as 12 electrified models and the e-tron is the first to open the floodgates. Targetting different body styles and price ranges, the vehicles will be underpinned by one of the four new flexible architectures across entry-level to high-end segments. The e-tron based couple-bodied Sportback is coming next year with identical mechanicals and fast charging system, while the electric sports car concept will debut later this year in Los Angeles based on a Premium Performance Electric platform developed in association with Porsche. Continuous emphasis will be put on plug-in hybrids in the future as well. Back to the groundbreaking e-tron that starred ‘The Charge’ event, it is a sporty premium SUV with high performance electric motors and an electric all-wheel-drive functionality for optimal performance. The brake energy recuperation system further boosts the efficiency by 30 percent as 90 percent of brake force can be converted back into driving power. All in all, the e-tron can muster around 500 km on a single charge and is the first volume-produced model to feature camera as virtual exterior mirrors ditching the traditional ones. The e-tron is the result of the Four Rings’ three years of testing and it will compete against Tesla Model X and Jaguar I-Pace, apart from the Merc EQC and production version of BMW iNext. 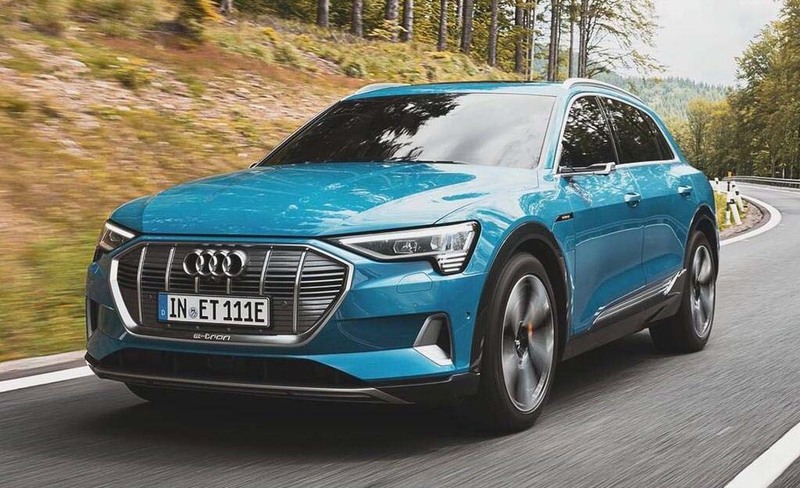 Available for pre-order in the US with initial token of USD 1,000, the e-tron uses a twin electric motor setup with combined system output of 355 horsepower and an instant torque of 561 Nm. The Boost mode extracts more juice from the 95 kWh lithium-ion battery pack mounted low on the chassis to aid optimal centre of gravity for greater ride and handling. On its full punch, the e-tron can deliver 402 horsepower and 664 Nm of peak torque as the zero to 100 kmph time reduces from eight seconds to less than six seconds when high performance is given the priority over efficiency. The e-tron has electronically limited top speed of 200 kmph and more importantly it can deliver more than 400 km on a single charge in the Worldwide Harmonized Light Vehicle Test Procedure (WLTP) cycle. The five-seater SUV is developed to charge with 150 kW DC high-speed public stations using the SAE Combined Charging System (CCS) and with the use of a fast charger, it can be charged up to 80 percent in around 30 minutes. The visual stance of the e-tron is anything but radical as Audi focusses on transforming its traditional customer base to electric mobility as well as targetting new ones. The interior boasts seven-inch OLED screens positioned below the windows as virtual mirrors with camera assistance and the driver can zoom in and out, and select from one of the three settings for parking, turning, and highway runs. 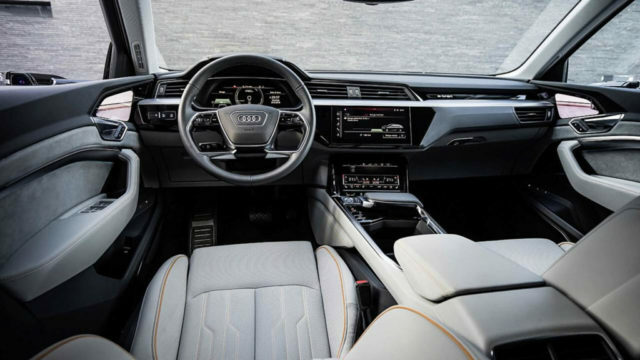 They are accompanied by fully digital instrument cluster, an infotainment system, and the touchscreen mounted lower on the center console for climate control settings as in the other high-end Audis. With less use of physical buttons, the e-tron boasts a number of driver assistance and safety features.